March 2015 - Sarah is very very pregnant in this picture. 2018: Retirement is treating Sarah well. 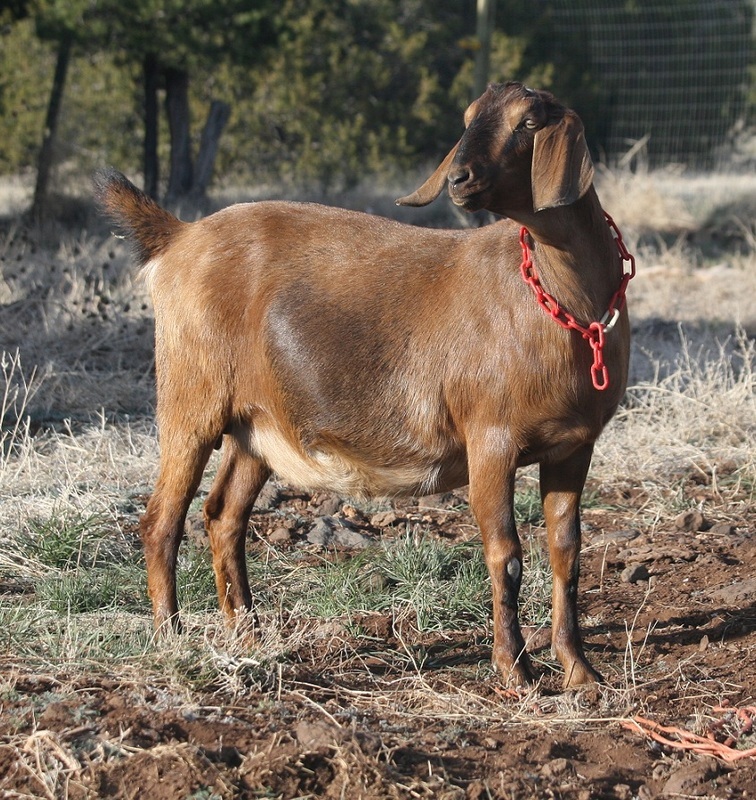 Though her feet are not the best, and we struggle to keep weight off of her, Sarah is still enjoying life! 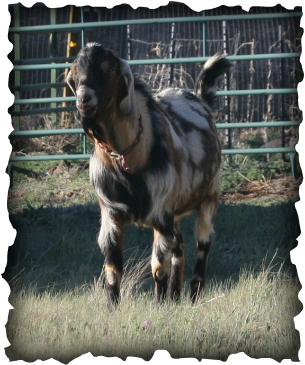 She is always one to check for treats and is easy to pick out among clumps of goats sunning themselves. 2017: Sarah is now retired. She has continued to be one of the biggest girls with the biggest hearts that we have. Sarah is still a very easy keeper and though she is no longer getting grain, we have been having a hard time weight off of her. Sarah is a going to remain with us as a pet and will hopefully be on a stricter diet at some point. 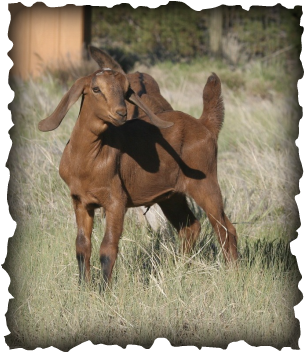 2016: Sarah continues to be a delight in the parlor, she is easy to milk, mild mannered and has continued to hold the record for the littlest grain fed to milk produced. We have an ongoing problem of keeping Sarah from be coming obese, she picks up weight VERY easily and we have a hard time getting it off of her. 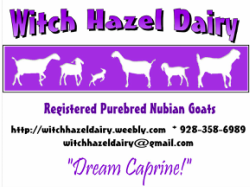 She was not bred at the end of this year, instead milked her through the winter and into the 2017 year. 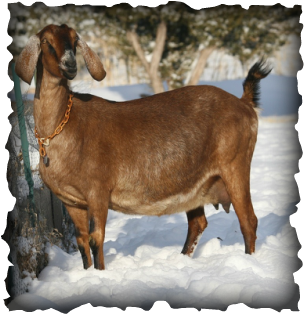 She has maintained that easy-keeping habit even in the winter. 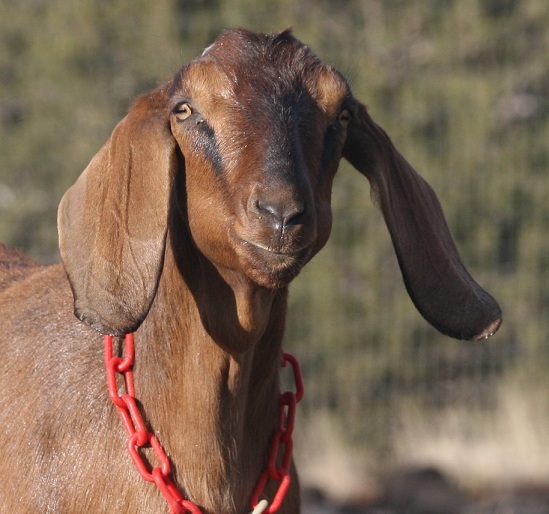 2015: Sarah is a short, stout and sweet girl who is a delight in the milking parlor. 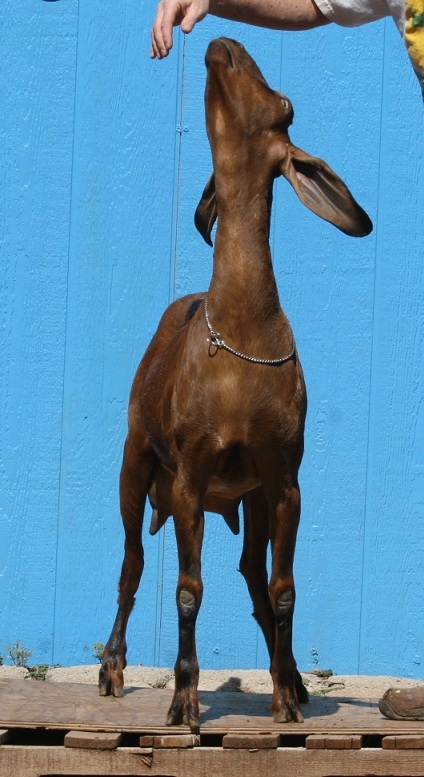 She always jumps on the stand backwards and then has to turn around while she balances on the stand. 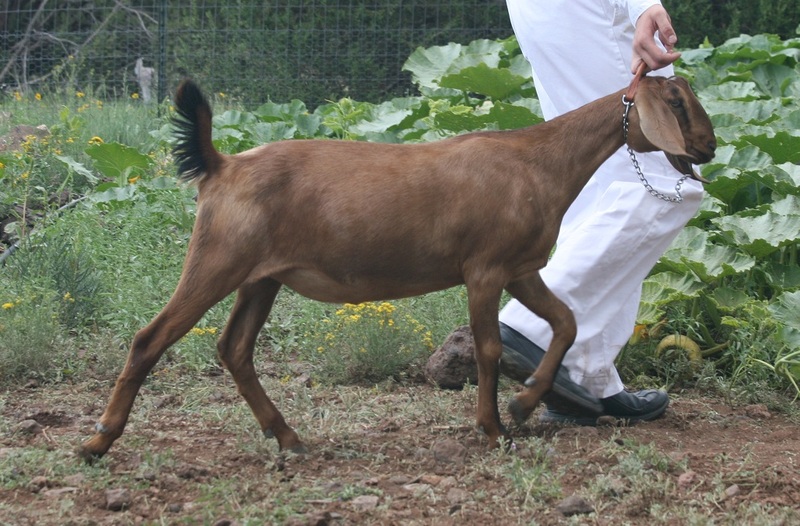 She is EXCELLENT at converting feed to goat, and has been described both as 'powerful' and as having 'excess flesh'. We decided her super-power was converting feed to flesh! 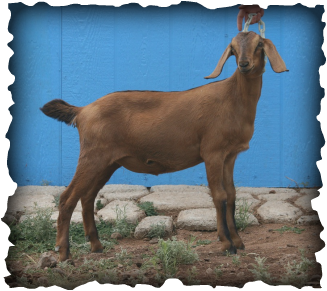 Sarah is an ideal family goat - efficient at converting food to milk, needs very little extra grain and happy to do her 'job' as a milker. 2014: No internet access, so no regular updates. We moved! 2013: Sarah loves people and is very friendly, her laid-back temperament is so nice! She is food motivated and we are so glad that we kept her. 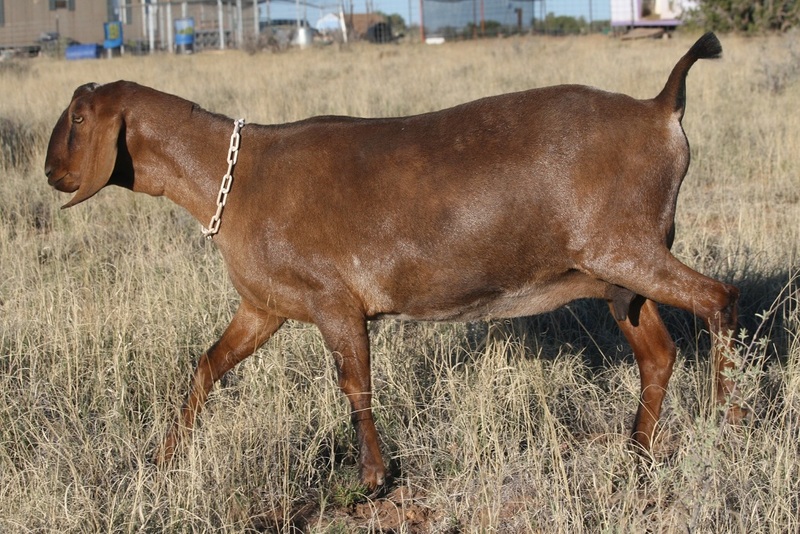 2012:The first doe that we get to keep! Thank you Sarina for providing two does! She is the first Witch Hazel kid ever to actually get my Dad to agree to keep! 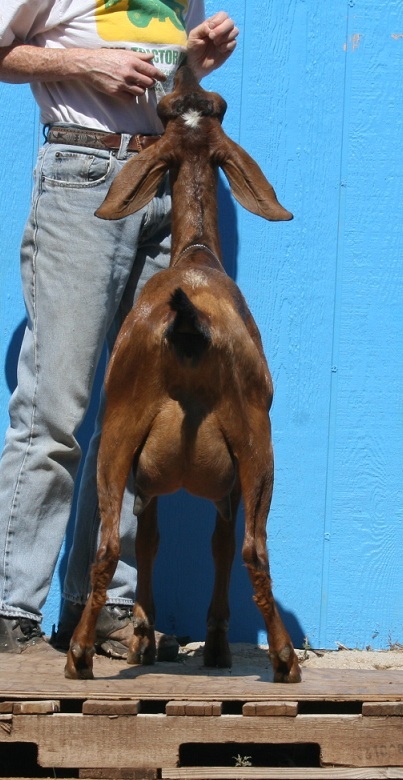 She is going to make a great addition to our herd. 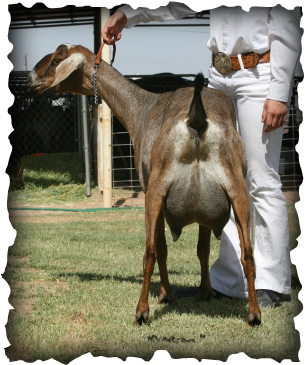 Casa Grande show 2012 - Sarina, Reserve Champion doe.